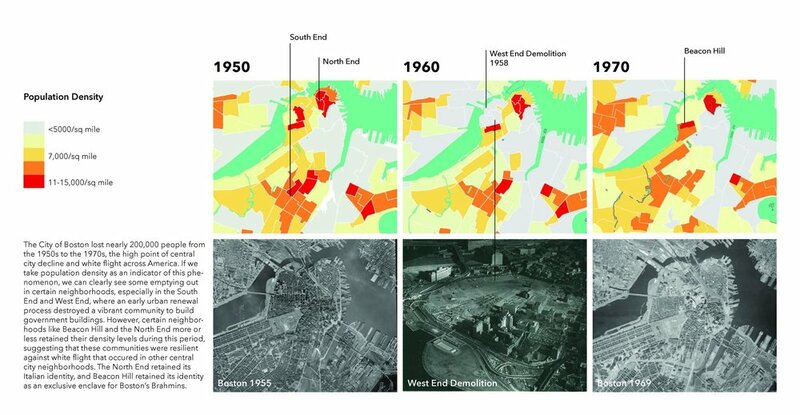 The first semester studio sequence began withintensive mapping and investigation of social, economic, transportation, and other conditions across Boston, focusing on the long neglected but rapidly gentrifying area of Dudley Square in Boston’s Roxbury neighborhood. Roxbury has been the center of Boston’s black community for decades. Previously, the community had been concentrated in the South End. By the 1960 the old nucleus of the community had moved definitively SE to Roxbury and then in later decades had pushed much further outwards into neighborhoods like Mattapan and Dorchester. A tightly concentrated and centrally located community in the 1950’s expands and by 1980 has become more peripheral within the city even as the total number of African Americans increases in Boston. As the map below shows, Dudley Square enjoys direct bus connectivity to many parts of the city. However, the square is currently a transit point and not a destination. The analysis of pedestrian and traffic flow shows areas of potential vehicle-pedestrian conflict in the square.